Finally, Ram trucks can now be had in tractor colors. 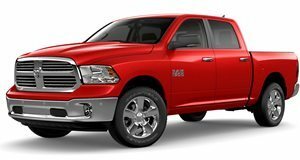 Ram has decided to celebrate the farming industry with a new model called the Harvest Edition. Claimed to be the industry’s first agricultural-market-specific truck, the special edition model is distinguished by two new body colors of Case IH Red and New Holland Blue. “The Ram Harvest Edition marks the first time that Ram dealers will be able to stock trucks that exactly match the colors of two of the most popular lines of farm equipment in the nation,” said Jeep and Ram boss Mike Manley. 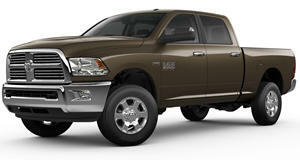 “Farmers have been asking for these colors, and Ram is proud to be the first in the industry to be able to offer them. The Ram Harvest Edition truck will allow farm families to get their work done while proudly showing their agricultural brand loyalty.” In case you’re missing the connection between these colors and the agricultural sector, Case IH and New Holland are farm tractors manufactured by CNH Industrial, which shares a common ancestry with FCA. Available on all Ram 1500, 2500 and 3500 models in all configurations, box lengths and powertrains, including the 6.4-liter Hemi V8 and 6.7-liter Cummins Turbo Diesel, the Harvest Edition comes loaded with work-related features. These include aggressive on/off road tires and an extra inch of ride height, to aid navigating farm roads and pastures, as well as black tubular side steps, a durable spray-in bedliner, fold-out bumper step and mud flaps, rubber floor mats, skid plates and tow hooks (4x4) and heated seats. Ram Heavy Duty models also get a cargo-view camera. Harvest Edition Ram trucks also get some nice standard equipment, such as an 8.4-inch UConnect 4C touchscreen and 4G WiFi. As well as the new colors, the Harvest Edition gets bright headlights, a chrome “Wave Mesh” cross-hair grille, bright bumpers, chrome wheels, mirrors, door handles and chrome-tipped dual exhausts. Other available body colors include Bright White, Brilliant Black, while monotone and two-tone color schemes are also on offer. 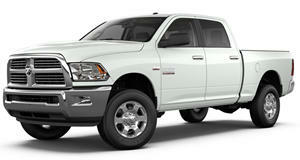 Prices for the Ram 1500 Harvest Edition start at $39,910 with Ram Heavy Duty models starting at $46,235. They will go on sale this fall.